The velvety strokes of pastel have enchanted fine artists for more than a century. From airy strokes to bold marks and soft hues to vibrant shades, the versatility of pastel makes it suitable for a wide range of subjects and moods. 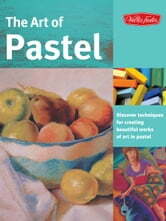 Now anyone can experience this multi-dimensional medium with The Art of Pastel. Inside this comprehensive guide, five artists provide instruction for using soft, hard, and oil pastel-each sharing his or her unique approach. From portraits and landscapes to rich floral scenes, this book contains a wealth of inspiring images that artists can re-create step by step.